Rumours suggest the Anaheim Ducks are listening to offers on everybody but John Gibson as they try to kickstart their rebuild on the fly. That means big names like Ryan Getzlaf, Corey Perry (injured), Cam Fowler and Hampus Lindholm could be had for the right price. 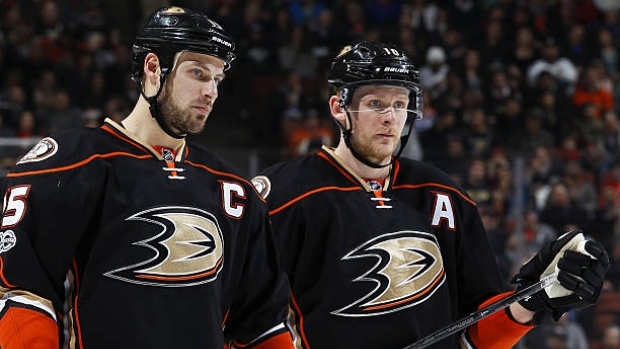 Perry and Fowler have seen their names in the rumour mill for years, but it's harder to see Lindholm or captain Getzlaf getting moved. Jakob Silfverberg will most likely be moved before the deadline if an extension can't be worked out. Pontus Aberg is available too. UPDATE: Aberg has been traded to the Wild. The list of Oilers prospects rumoured to be available for trade is starting to surface: in addition to the obvious one of Jesse Puljujarvi, names like Kailer Yamamoto, Tyler Benson and Cameron Hebig have emerged in the rumour mill. Draft picks and goaltenders - presumably both Cam Talbot and Mikko Koskinen - are also reportedly being dangled on the market. Derick Brassard's name has cropped up again in the rumour mill as the centerman continues to underperform for the Pittsburgh Penguins. Rumours suggest it's now more likely than not that he's dealt at some point, likely in a classic 'hockey trade' player for player transaction. The Penguins acquired Brassard to provide third line center depth, but he's probably better suited in a more offensive second line role. The Penguins have been linked to Carl Soderberg, Brayden Schenn, Jakob Silfverberg, Jake Muzzin and Alec Martinez in trade rumours. The list of suitors for Brassard is believed to include the Jets, Sharks and Blue Jackets.